Homeless Man Steps Up To Piano And Stuns Crowd With Beautiful Performance.. Many times when we pass homeless people on the street, we forget to stop and think about the amazing minds and talents that these people possess, and how despite their unfortunate circumstances, they are still amazing human beings capable of amazing things. A recent viral video of a homeless man playing a piano shows us just that, and has made millions across the world stop and think about the talented and brilliant souls who they may be passing on the street every day. 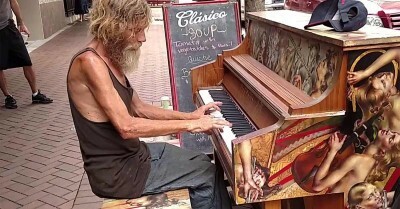 It happened in Sarasota, Florida where a local homeless man, Donald Gould, stumbled upon a public piano that was recently installed on the city’s streets. According to News.AU the piano was donated as part of the Sarasota Keys Piano Project, which hopes to encourage creative expression in public spaces. “I might not do the whole song complete as it was recorded originally, but I know enough to touch people out here -‘cause I’ve touched a lot of people, apparently,” Gould told reporters. Gould then revealed that he had turned to a life of substance abuse after his wife passed away, which eventually resulted in a life of homelessness, explaining how good people many times end up in bad situations. Since the video went viral, Gould has some potential job opportunities, and he may actually be hired as a performer at a local bar.